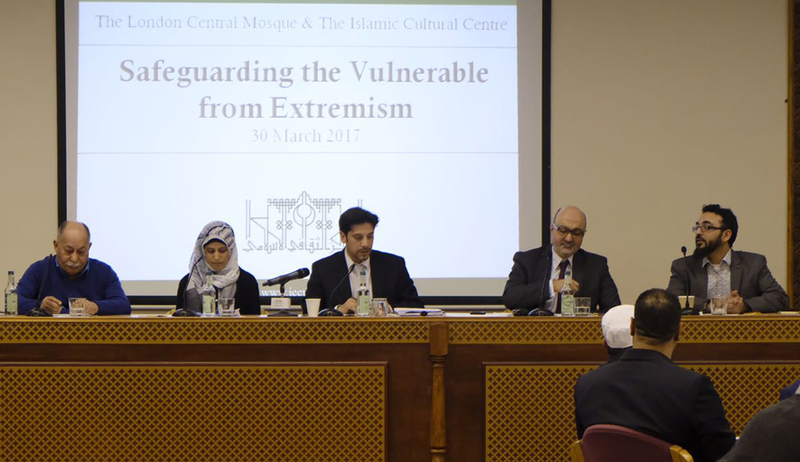 The Islamic Cultural Centre, in cooperation with the UK Home Office, conducted an evening encompassing the central theme of protecting the new generation of extremism, in which a group of experts, psychologists, social workers, teachers and imams discussed the protection of youth from extremism and violence. 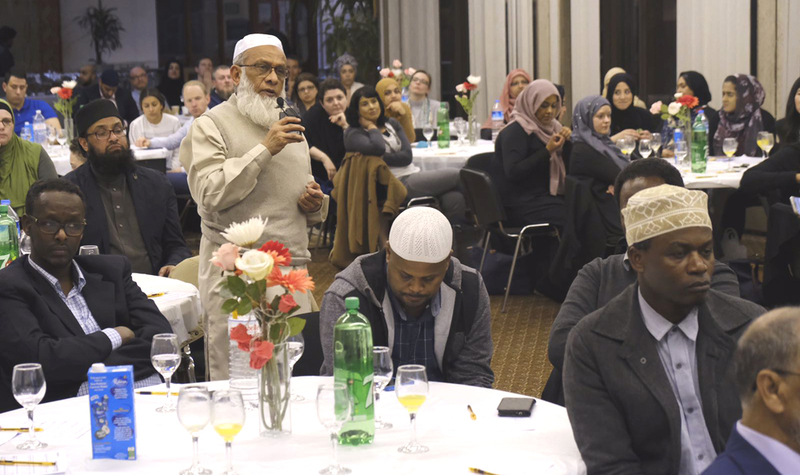 The event was attended by about 120 people from community leaders, activists and heads of Islamic Organisations and associations. The event comes in the aftermath of the Westminster Terrorist attack and the prominence of safeguarding community to eradicate the threat of violence and to counter act the extremist narrative. 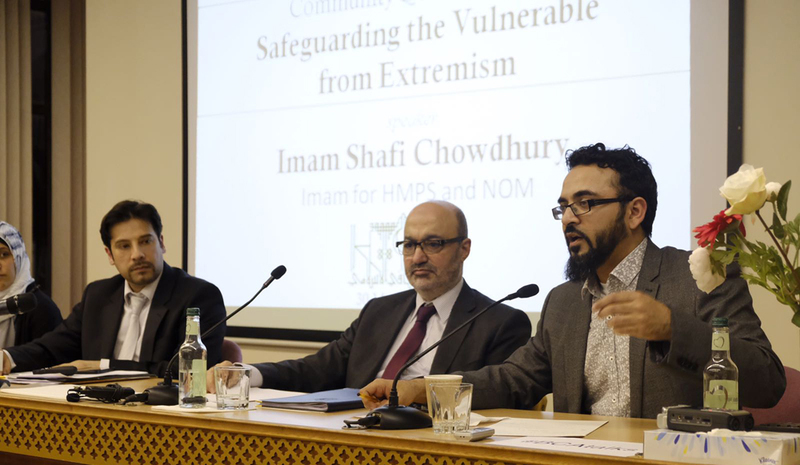 Panellist: Sheikh Shafi Chowdury, Imam and religious advisor for Her Majesty's Prison Services. 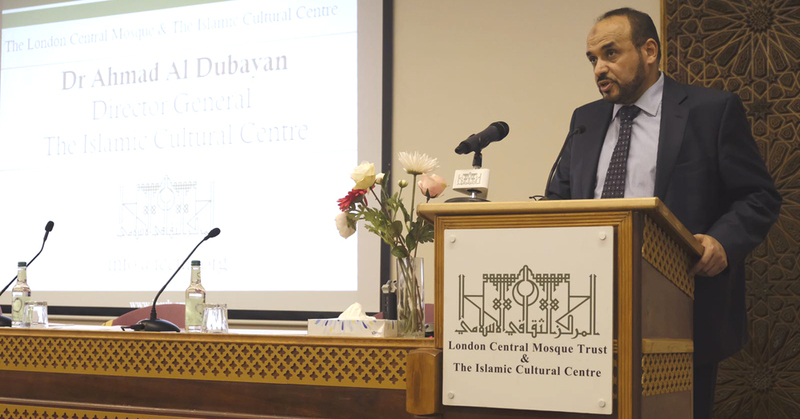 The event was opened by Dr Ahmad Al Dubayan, Director General of the Islamic Cultural Centre. In Dr Al Dubayan's opening speech he addressed the august audience and paid the Trustees of the Centres warmest regards and appreciation to the UK Home Office for their cooperation in events such as today which aim to raise social awareness and security in the wider fabric of society. Dr. Al Dubayan pointed out that violence is a phenomenon in which several factors are involved. It has been unrightly to be attributed and association to religion. He pointed out that there are many factors that are intertwined in the formation of this type of thought, such as the problem of unemployment, lack of education and understanding, ignorance of society, etc. These are all reasons that lead to rejection of society and self-sufficiency and then ultimately to violence. Dr. Al Dubayan also mention how The Islamic Cultural Centre adopts programs to save young people, and to spread notion of communal peace, and to promote the social and cultural rights of the youth, and clarify the principles of Islam. Dr. Al Dubayan further explored how the Centre is working with some social and trained experts such as our Honorary Advisor, Ahmad Abd El- Ghani, to develop a vision of a proactive, peaceful vision on the prevention of extremism; from assessing risk-factors and taking care of youth's vulnerability to extremism before. Mr. Ayaz Zuberi, Head of Public Relations at the Centre and panel Chairman of the evening welcomed the panellists and gave a brief induction of the format of the evening. Mr. Zuberi brought attention to the audience the attack which took place at Westminster on 22nd March 2017 and conveyed the Centre's condolences to the families affected by the attack and prayed to God - The Almighty - to safeguard us all from such shocking terrorist attacks and thanked the police and emergency services for their swift response in keeping our country safe and protected. Mr. Zuberi also informed the participants that Dr AL Dubayan and the Islamic Cultural Centre had a meeting with the Home Secretary, May of London and Faith Leaders to show solidarity and community cohesion amongst all. Ms. Mariam Hamoudi informed the participants of the event that she has been working in the PREVENT programme for 2 years in her capacity as a social worker engaging in women's issues. Ms. Hamoudi stressed on the importance of reducing risk factors relating to extremism which may include bullying in schools through mechanisms and ways she can give advice and consult with youth and the younger generation. Ms Hamoudi also gave an informative talk on the role of the PREVENT unit in approaching and safeguarding the vulnerable from Far-right extremism. Dr Mustafa Abu-Lisan, discussed the prominence of outreach programmes with schools, religious centres and local community by the PREVENT unit as a mechanism of educating wider-fabric community as tactic in counteracting extremism. Dr. Abu-Lisan is a founder of the Chelsea Muslim Community Hub which promotes tolerance, integration and peace and provides a haven for Muslim families to socialise and celebrate family values that protect young people from drugs, alcohol and antisocial behaviour. 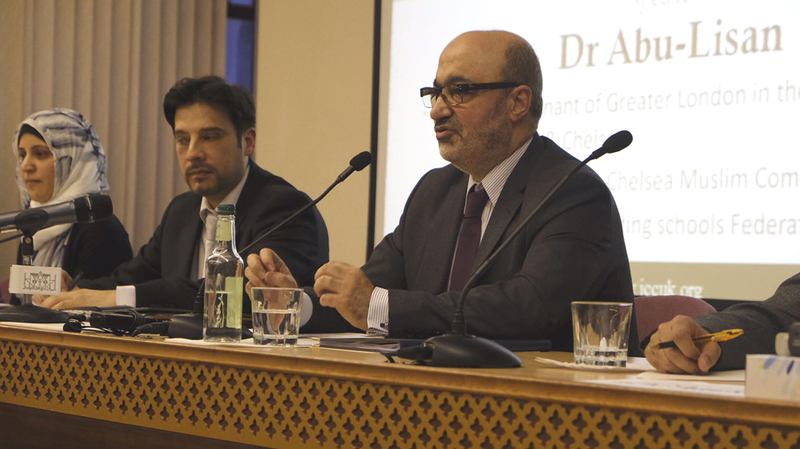 Dr Abu-Lisan throughout his address connected his experience and its importance of promoting community cohesion and interconnected to reduce the threat of extremism. 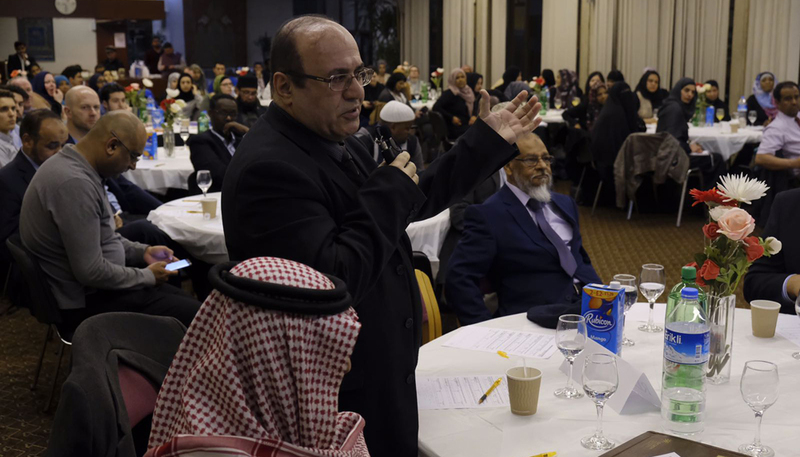 Sheikh Shafi Chowdury, presented to the audience his experience working with in HM Prison Muslim Chaplaincy where he found education was a prominent tool as a method of safeguarding and protecting vulnerable adults and youth offenders. 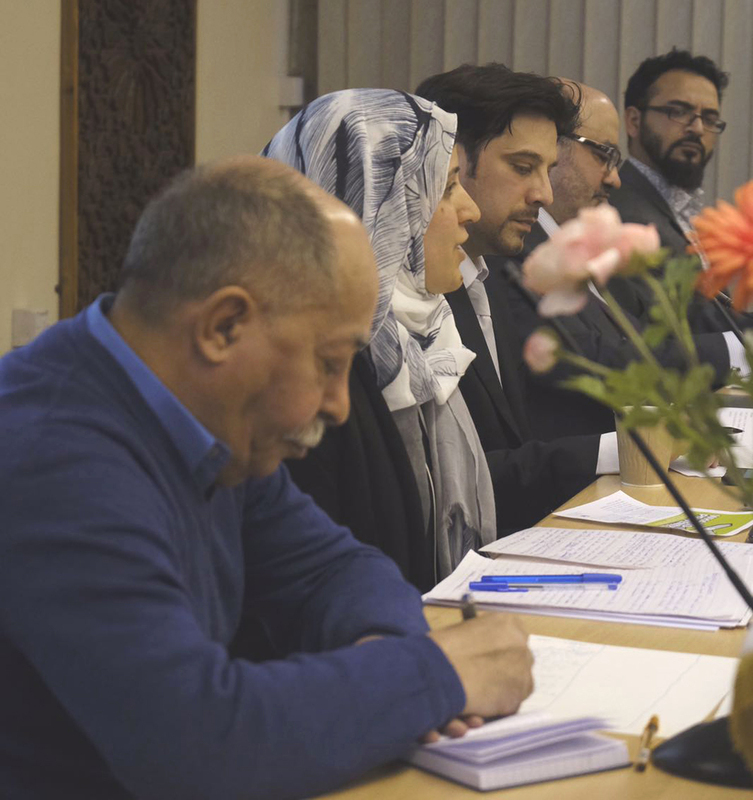 Imam Shafi highlighted that changes in deamour of prisoners was a problem facing Muslim Chaplaincy and through creating better theological understanding and increasing methods of communications will help people integrate more in society and significantly reduce threats of extremist nature. Speeches were preceded by a half-hour question and answer session with the audience and Dr Al Dubayan concluded by thanking all for their attendance and participation within the event and was delighted to see such engagement and enthusiasm during the evening. Dr. Al Dubayan paid tribute to the Trustees of the Centre for their invaluable support in the activities of the Centre and thanked the UK Home Office for their collaboration in the event and finally thanked his colleagues in the Islamic Cultural Centre for their hard work and diligence in preparation of the event.